Final year project presentation and defense has come to remain, and the only path to graduate in Nigerian universities is to at least defend what you have written (or copied and paste) in a convincing manner. Gone are those days when you might just copy and paste information from the web and submit to your supervisor. Our Nigerian university system has changed – you must be good at presentations to defend your project work to be able to obtain your degree. Sometimes students mistake themselves with content of the work. The simple truth is that it’s better to become more confident with poor content, than to be unable to defend an awesome research work. 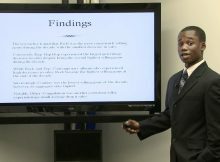 In this specific post, I will hand out some useful guidelines about how you could have an awesome final year project presentation and defense. let’s ride! Presentation is the way that you are going to sell your products. You might face with different situations. Some departments ask students to present the outcome of their projects in front of a panel of academic staff in a way that is expected for a viva in postgraduates. However, many departments are not asking for this kind of presentations. As this post aims to help postgraduates in their final project as well, I decided to dedicate a 1080 word count to this post. As undergraduate students, even if you are not requested to present your final year project, the guide can be useful in other situations when you have to do so. Final year project presentation is an activity, which takes place in a short period, usually between 10 to 20 minutes. Therefore, its structure, preparation, contents, and delivery should be very well designed and implemented. Presentation provides you with a unique opportunity within which you are able to introduce your capabilities on the subject, understanding of the chosen topics, and presenting the results and outcomes of your project. In this post, I will give some specific explanation on how you can prepare yourself for this important event. Do not forget that this activity must have been planned and scheduled in your project plan and you should be very careful on the timing of the event. Your final year project presentation should be organized based on the allowed timing. Below I will provide two scenarios. In the first scenario, I assume that you have 20 minutes, which has been divided to three sections; 5 minutes for preparing the venue, 10 minutes for your presentation, and 5 minutes for question and answers. In the second scenario, I assume that you have 30 minutes of which 5 minutes are for preparation, 15 minutes for your presentation, and 10 minutes for questions and answers. Let me know here if you need help to prepare your presentation tools such as Microsoft PowerPoint or Apple i-Work as they help to organize your presentation in an efficient manner. In addition, I can provide you with some predefined templates, which make your job easier to do. However, if your department requires you to prepare your presentation based on a departmental template then you are obliged to follow their template and structure. Below you can find two proposed structures for your final year presentation. In these samples, presentation timing, its agenda, proposed title for each slide, and proposed timing of each section/slide have been shown. These suggestions should not be taken for granted. They are not rigid suggestions. Final year project presentation is a very constructive activity and you should show your creativity in composing it. Therefore, take these samples as a guideline and be creative as much as you can. Preparation has two stages. The main stage should be finished at lease several days before the actual presentation. Below you can find some useful tips that you can consider with regard to the presentation preparation. Make sure that you have scheduled this activity in your project plan. In addition, it is a good practice if you ask your supervisor to review your presentation before you go live. You might be asked to present a quick show on your product, if the product is software. In this case, you have to check with your supervisor to arrange the presentation venue to be ready for you in terms of required hardware and software. Presentation is a skill. You have to practice it in order to become a skillful presenter. I assume that many of you have had at least one presentation. Presentation is similar to a play, and therefore, you have to rehearse it. There are different ways of rehearsal. The best method can be in front of some similar audience and in the same venue that the presentation is expected to be performed. However, this is not something that is always possible. Consequently, you have to rehearse it at home alone or in front of your family, possibly your siblings, or in hostel in front of your roommates, in campus in front of your classmates, or in front of your supervisor. If none of these is the case, then try it in front of a mirror! Have a clock in front of you; look at your gestures; or if you are using presentation software utilize its automatic slide movement. This is the time when your show is going live. Below you can find some tips about it. Presentation is the time that you sell your product. A good presentation requires some specific skills, which, hopefully, you have gained and practiced during your study. Some good rules of thumb help you to provide an attractive presentation. Moreover, you can find useful resources available on the Internet that can guide you in this regard. However, an important step is to rehearse your presentation in front of some audience, your classmates and university fellows for example. This rehearse step can give you more confidence while when you are going to provide your real show. Moreover, it can reveal some flaws and problems in your presentation. Thanks for sharing this post with us. This will help many final year students in there presentation making. Presentation provides a unique opportunity within which we are able to introduce your capabilities. I Hope it will help many readers.